Joe's action on his guitar would be considered high for most guitarists. 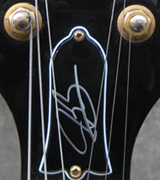 although Joe states his neck is almost dead straight, you may need a truss rod adjustment for you guitar. Not sure if you're still having issues but I would 2nd the truss rod adjustment. Just remember a little goes a long way so don't go crazy with that screw, small 1/8' turns can make a lot of difference. Also make sure the intonation is set.